Tannehill Ironworks Historical State Park, part of Alabama State Parks near the unincorporated town of McCalla in Tuscaloosa County, Alabama. Listed on the National Register of Historic Places as Tannehill Furnace, it was a major supplier of iron for Confederate ordnance. Remains of the old furnaces are located 12 miles (19 km) south of Bessemer off Interstate 59/Interstate 20 near the southern end of the Appalachian Mountains. With more than 1,500 acres in three counties set aside for hiking, camping and outdoor recreation. A miniature railroad chugs through the pines. From spring through fall, the blacksmith, miller and craftsmen demonstrate their trades. Craft shops occupy restored pioneer cabins and artisans chat with visitors from their front porches. Steeped in history, Tannehill feels timeless. The cotton gin, pioneer farm and working gristmill preserve a long-gone way of life. Hiking trails retrace historic roadways. Artifacts of Alabama’s 19th century iron industry displayed in the Iron and Steel Museum put in perspective the massive stone furnaces, Tannehill’s awe-inspiring centerpiece. The Pioneer Farm, located alongside Mill Creek near Farley Field, is a collection of 19th and 20th Century farm buildings and the site of the park’s working blacksmith shop. A number of the structures are from the George Stewart Farm which was located near Maplesville in Chilton County. It was also designed to house a number of early day farm implements donated by Dr. H. C. Springer of Bessemer. The site also includes a sorghum mill, smoke house, gear shed and corn crib. The oldest building in the park, a milk storage building dating to 1822, is also located here. the Gott House, built by noted Appalachian Mountain cabin builder Peter Gott as part of the “Alabama Reunion” in 1989. Iron & Steel Museum of Alabama also known as the Tannehill Museum is an industrial museum located at Tannehill Ironworks Historical State Park in McCalla, Tuscaloosa County, Alabama. Opened in 1981, it covers 13,000 square feet (1,200 m2). The museum is an interpretive center on 19th century iron making technology and features belt driven machines, tools and products of the times. It focuses on the Roupes Valley Ironworks at Tannehill which operated nearby during the Civil War. The museum has numerous exhibits relating the production of iron and steel during the American Civil War when Alabama once had 13 different iron companies and six rolling mills producing some 70% of the Confederate iron supply. The museum underwent a major renovation of its exhibits in 2004-05. The collection includes rare steam engines, forge cams and war materials manufactured at the CS Naval Gun Works at Selma, Alabama. A concrete pathway, added under a federal enhancement grant, also extends from the old spring to Farley Field, a distance of about one mile. All park trails provide an easy walk, most over wide dirt roads, some of which were originally used as early "interstates" traveling between towns and regions such as the Bucksville Stage Road which runs near the Boy Scout area known as [[Camp Jack Wright. Park trails run between one and four miles in length and a trails map may be purchased at the Country Store or Museum Gift Shop. Hiking and birding are major activities at Tannehill. Ironmaking at the site began with construction of a bloomery forge by Daniel Hillman Sr. in 1830. Built by noted southern ironmaster Moses Stroup from 1859 to 1862, the three charcoal blast furnaces at Tannehill could produce 22 tons of pig iron a day, most of which was shipped to the Naval Gun Works and Arsenal at Selma. Furnaces Nos. 2 and 3 were equipped with hot blast stoves and a steam engine. Brown iron ore mines were present two miles (3 km) distant. The Tannehill furnaces and its adjacent foundry, where kettles and hollow-ware were cast for southern troops, were attacked and burnt by three companies of the U.S. 8th Iowa Cavalry on March 31, 1865 during Wilson's Raid. 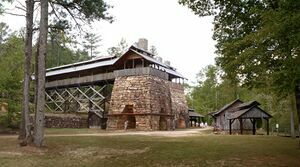 The ruins remain today as one of the best preserved 19th-century iron furnace sites in the South. Also known as the Roupes Valley Iron Company, these works had significant influence on the later development of the Birmingham iron and steel industry. An experiment conducted at Tannehill in 1862 proved red iron ore could successfully be used in Alabama blast furnaces. The test, promoted by South & North Railroad developers, led to the location of government-financed ironworks in the immediate Birmingham area (Jefferson County). This page was last edited on 13 January 2018, at 20:35.